These books can be purchased as e-books or hard copy (via Amazon). Hard copies also available from The Book Depository or Fishpond NZ). ﻿A source book for everyone who spends time with horses. Whether you have horses for fun, competition, or as a profession, there is something in this book for you. Clearly written, without scientific jargon, this book helps us understand how our body language affects our horse. It explains how a horse’s perception of the world is different from our human perception because horses sense the world differently. Whether you are getting acquainted with your first horse or have spent a lifetime with horses, the detail in this book is illuminating. No matter what training system you use, this information will increase your awareness about what you are saying to your horse and what your horse is saying to you. It looks at the human and the horse as two beings who speak different languages and are meeting without an interpreter. 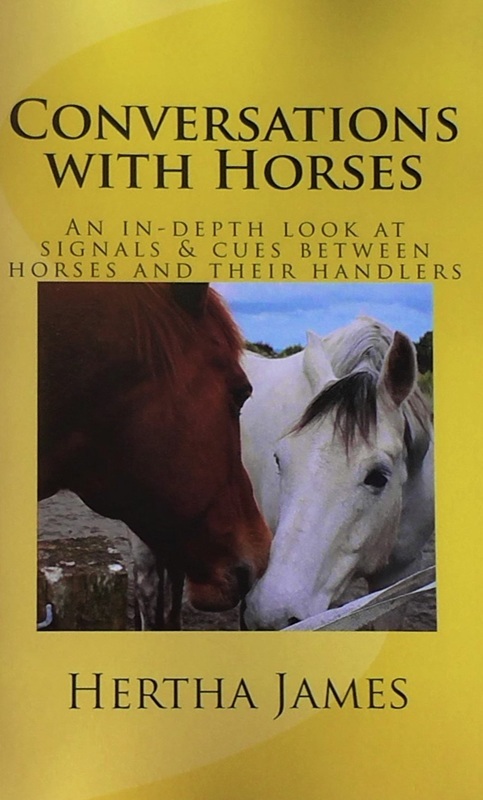 The book explores the detail of the ways we can use our body language, breathing, energy levels, intent, gestures, touch, words and marker signals to let horses know what we would like them to do. It also details the way horses express themselves to us, once we know how to look and listen. The book is illustrated and includes links to video clips that help explain many of the concepts. The final sections present eight Training Plans that can be used as springboards to write Individual Education Programs for specific horses. Whether you teach your horse by releasing signal pressure, adding a rub or rest after the release, occasionally use a food treat or do Clicker Training which uses a marker signal and a treat in combination, to highlight the response you want, this book has something for you.